In a large saucepan, melt eight tablespoons butter. Stir in flour, parsley, salt, thyme and pepper until smooth. Gradually add milk and half and half; bring to a boil. Cook and stir for two minutes. cake pan). Top with half of the sauce; repeat layers. butter. Bake uncovered, 15-20 minutes longer or until potatoes are tender. This is a very large recipe. Great for a potluck! Looking for a quick tasty dinner or pot luck casserole? Well here’s one! sausage, drain and rinse. Sauté the onions in oil until done; add the mushroom soup and let simmer for 10 minutes. Add sour cream and cooked noodles to mixture; stir well. 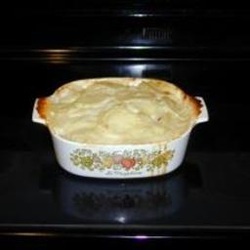 Place in greased casserole dish and top with Parmesan Cheese. Bake for 15 to 20 min. Make a quick fresh salad and dinner is on the table. beans, chili powder and cumin. Simmer uncovered 10 minutes. In a 11 ½ x7 ½ casserole arrange in layers 1/3 of the tortilla strips, 1/4 tomato / bean mixture, 1/3 olives, 1/3 cheese. Repeat layers ending with sour cream and ¼ of tomato mixture. Top with reserved cheese. Bake for 30 minutes. In a saucepan cover asparagus with water, cover and cook until tender but still firm. Drain and set aside. Lightly brush butter over one side of the bread slices, place buttered side up in a greased 13x9x2 baking dish. Sprinkle with ½ cup of cheese. Layer with asparagus and ham, then cover with remaining bread, buttered side up. In a bowl, lightly beat eggs; add milk, onion, salt and mustard. Pour over bread. Cover and refrig-erate overnight. Bake uncovered at 325°F for 50 minutes. Sprinkle with remaining cheese and return to oven for 10 minutes or until cheese is melted. Test for doneness with a knife inserted near the center - when it comes out clean, the strata is ready . The following fresh herbs: Dill, oregano, sage, tarragon, thyme, lemon thyme, basil, chervil, sorrel, pineapple sage, fennel weed. Cook 10 min and cool slightly. Mix following ingredients and add to cooled mixture and bacon. 8 oz. shredded gruyere cheese, can add some Swiss and Havarti. Sometimes I add a little sautéed spinach. Spoon into 6, 8 oz ramekins, put on a tray and cook for 25-30 minutes at 375°F until puffy and browned. When, done remove from tray and let cool down. They will sink down some. You can also pour into a prepared pie crust and bake 40 minutes. I also use this for my salmon quiche and leave out the leeks. Add a 15 oz. can of salmon and add 1/2 C onions and sauté.